In a previous post you’ll see I made fresh sweetcorn polenta, (sort of creamed corn.) using the fresh corn kernels stripped from it’s cob. Luckily part of our seasonal shopping haul on Monday at Ridley Road was sweetcorn still wrapped up in their own silks and skins. Three for a £1 thank you very much. We were cooking dinner, my friend Mark and I. I made the polenta as before, then realised we didn’t really need it with Mark’s main of slow braised ox cheek. (though it would’ve made a very good accompaniment for it.) So Mark said why not make a dessert with it. Here it is, and it was a treat. …..and then I had it with chocolate…see below…..
So…..Sweet Sweetcorn Polenta with Roasted Greengages, Plums and Nectarines or Chocolate…. Little note…..You really won’t need to sweeten it when serving with something sweet, but you could always melt a couple of tablespoons of sugar into it if you fancy. 1. Preheat oven to 200 C/180 fan/Gas 6. Halve, destone the fruit and drop into a baking dish. scatter with the sugar, cover with foil and place in oven for about 20-30 minutes or until the fruit is really tender. Set aside. 2. To make the fresh corn polenta, pull off the green outer husks from the corn if they are wearing them, and pull away the inner silks. (the silky stringy threads under the leaves.) then slice off the kernels off from top to bottom. 3. Place the corn kernels in a large pan with the water or milk the butter and a pinch of salt. Bring to a boil, cover, reduce heat and simmer for about 15-20 minutes or until tender. 4. Drain the corn, reserving the water and pour this water back into the pan. Tip the kernels into the bowl of a food processor and whiz until as smooth as possible, adding a little of the cooking water so you get a smooth paste. 5. Scrape the corn paste into the pan of reserved cooking water, add the cardamom pods and cinnamon and bring to a boil. Reduce heat again, and simmer gently, stirring frequently, for about 15 minutes or until the mixture becomes thick and creamy. 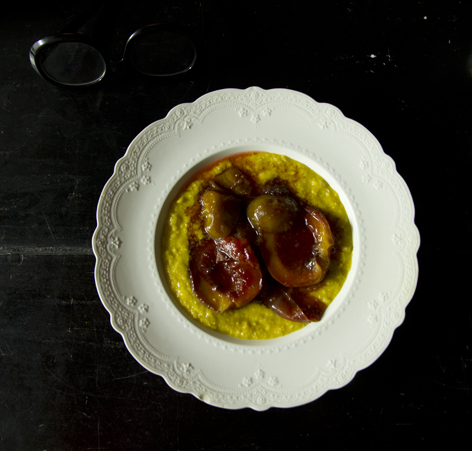 Serve the warm polenta topped with the roasted fruit and some of the fruity juices…. Next day…….hungry for something sweet again I warmed some of the polenta up and stirred in a few chunks of chopped dark chocolate….need I say more….. This entry was posted in Nuts & Fruit, October, Puddings, September, Vegetarian and tagged cardamon pods, corn kernels, ridley road. Bookmark the permalink. Very nice photography. The intense, dark background works so well with the white and the yellow. Hi praise indeed. Thank you.